Your mortgage rate depends on many factors like the economy, your credit scores, the kind of property you’re purchasing, and others. One factor that you have a lot of control over is the loan you select — it’s features and terms. 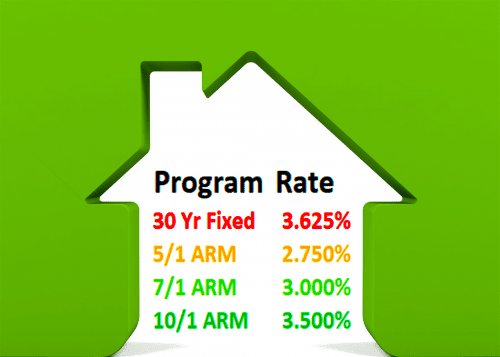 What features affect your mortgage rate? We’ll look at how much each of these features adds or subtracts from your mortgage rate or fees in this post. ARM products are less risky for mortgage lenders, because if interest rates rise during the term of the loan, the lender gets more interest income. With fixed loans, the lender will still be getting a low rate even if inflation takes interest rates and other costs higher. But no one would take on an adjustable loan without some inducement. To get borrowers to choose ARMs, lenders have to offer a lower interest rate. 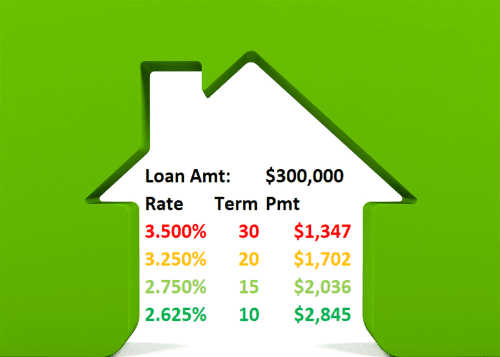 How low the rate is depends on how long the loan’s starting rate will be in force. It may be one, three, five, seven or ten years. The table below shows one lender’s pricing for several ARMs. Interest-only loans let you make lower payments in the early years of your mortgage — often, the first five. This can increase your cash flow during those first years of home ownership. The mortgage offer in the mail: Should you accept? However, it’s risky for you and the lender, because after the initial interest-only period, the loan re-casts. That means the balance, which does not drop during the interest-only period, must now be repaid over the remaining 25 years of the loan. That can cause a striking jump in your mortgage payment. The idea is that hopefully, after five years, your income is high enough that you can comfortably make the higher payment. But if you can’t, the lender ends up with a foreclosure on its hands. Interest-only loans often have rates about .25 percent higher than loans without this feature. Another feature that affects the lender’s risk is the loan term — how long you get to pay it off. From the lender’s point of view, shorter is better. That’s because you accrue equity faster, and homeowners with more equity are less likely to default. What’s better? The 5/1 ARM or 15-year fixed loan? 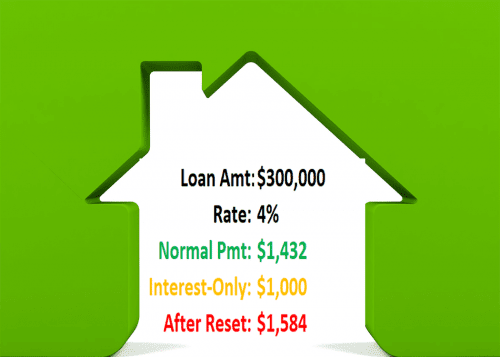 In addition, the lender has less time to deal with interest rate risk. You can see this below, in the difference in rate for a 10, 15, 20 and 30-year loan. Prepayment penalties are designed to alleviate another type of risk the lender faces — early payoff risk or reinvestment risk. That’s the chance that the borrower will sell or refinance the house before the lender has a chance to earn a profit on the loan. To reduce this risk, lenders may offer loans with prepayment penalties at a lower interest rate — about .125 percent to .375 percent lower. Can 15-year mortgage rates make you rich? The catch is that if you pay your loan off early (many penalties last for two or three years), you can incur a costly penalty. It may be several months of interest (six is common) or a certain percentage of the loan amount (often this starts out at three percent the first year, two percent the second year, and so on). Prepayment penalties can be “hard,” which means they apply any time your loan is paid off before the penalty phase ends. But they can also be “soft,” which means they only kick in if you refinance, not if you sell. Some penalties kick in if you prepay more than 20 percent of your balance in a year. Cash-out refinancing means replacing your old loan with a larger one, and taking the difference in cash. Mortgage lenders find these transactions to be very risky, and so the cost of cash-out refinancing is pretty high. The illustration below is from Fannie Mae’s Loan Level Pricing Adjustment matrix, and you can see how much extra you pay in fees for cash out, depending on your credit score and loan-to-value. Current mortgage rates are very, very low. But you can get an even better deal if you choose a loan with the right features for your needs.